The mosquitoes started buzzing around for the first time today, so we knew it was time to start tapping birch trees. Birch sap is a delightful, slightly sweet drink loaded with vitamins and mineral. By this time if year, it's been several months since we've had any fresh fruits or vegetables, and birch sap is an energizing "Spring Tonic". This might not be a national holiday, but around our house Birch Tapping Day is cause for celebration! This day goes on the calendar as the day we started replacing all of our drinking water with birch sap. 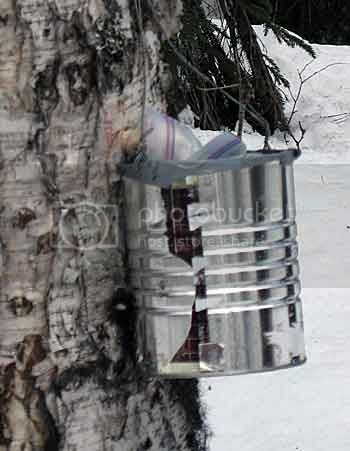 I'm sure our spring water is great, but there's nothing like ice cold birch sap straight from the tree. We'll treasure the next two weeks while the sap is running.
. It's great for helping you learn the basics to get started. 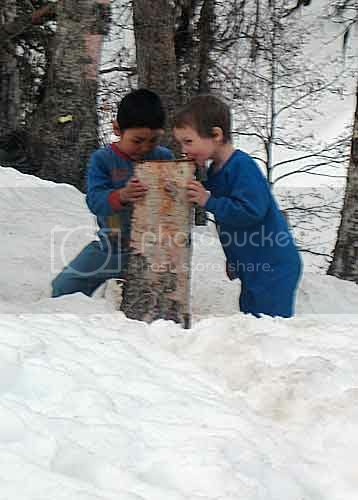 Zeke and Jed found a birch stump that started running several days ago, but it was on a sunny, south-facing slope. Since the place we go to tap is shadier, the trees there are usually a few days behind. 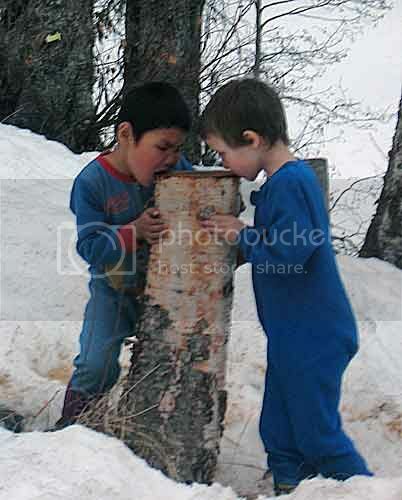 The boys were so excited about this beverage God provides each year that they spend lots of time at the stump slurping up the sap as quickly as it oozes out. Whenever they get thirsty, they wander over for a drink of the sweet sap. Here are two pictures of them sucking sap from the stump just before bed the other night. Jed and Zeke helped gather up all the equipment today and were ready to tap some trees! Here's Chuck drilling a small hole in the first tree. Chuck made the spouts out of pieces of spruce. He cut pieces about 3" long, shaved them to size and drilled holes through the middle. In this picture you can see a drop of sap just starting to come out. Some people just carve a channel the length of the spout to direct the sap, which is what we have done in the past. But we found that the exposed channel tends to attract more bugs. Here's one of the coffee cans hanging beneath a spout. We put a zip top plastic bag in the coffee cans and try to seal it up as best we can over the spout to keep out bugs. Just a few hours after we tapped the trees, two of the four had already put out nearly two quarts each. I expect they'll be overflowing by morning when we check them again. Might have to find larger containers. I think next year I'm going to try my hand at making a little birch syrup. I wanted to do it this spring, but too many irons in the fire already. 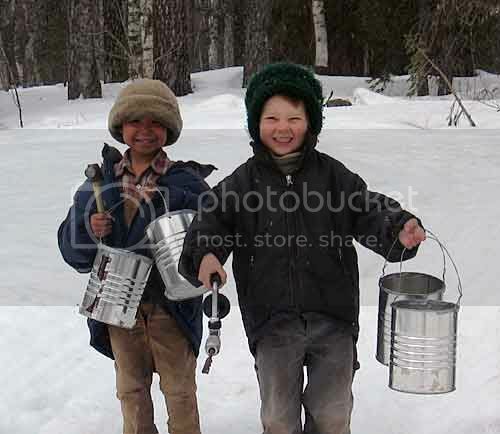 It takes something like 80 to 100 gallons of birch sap to make just 1 gallon of syrup. I've read that a gallon of maple syrup only requires about 40 gallons of sap, so you can see this would be a huge time commitment. With four trees tapped so far, we'll have plenty of sap to drink, and enough to share with the dog and cat. I'll use the extra as the liquid when I make soap. I wish I knew of a way to preserve the sap for year-round drinking. I've read that a company in Russia bottles birch sap and sells it all over the world. The extension service told me that it would not be safe to do only a boiling water bath. 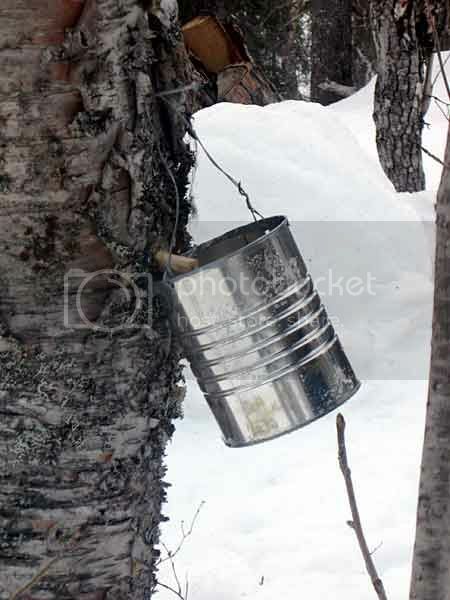 I've thought about pressure canning the sap, but I wonder if it would kill most of the nutrients. If anybody reading this has an idea about that, please let me know. 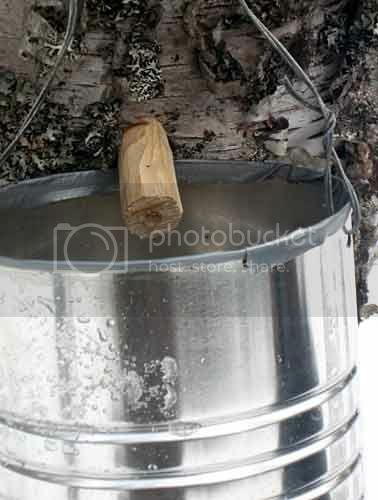 Can you freeze the sap? I wonder if you could use the large 5 gallon food grade plastic buckets, the kind with lids on them, and run some sort of plastic tube from the tap into the bucket. Hi April. Thanks for stopping by. Yes, people who tap lots of trees and make syrup to sell do that. The sap can be frozen. If we had a propane freezer to run during the warm months, we'd certainly tap more trees and do that. I canned it one year, but then was told by the extension service. Normally, I question anything the extension service says, but they got their information from a man who produces quite a bit of birch syrup. It will be birch tapping time again next month here in the UK. Last year I made Birch sap wine with some of the sap I collected,this year I may make some birch sap beer. Ive yet to make the beer but do have the wine recipe,Ill go find it and your welcome to post it on your blog. Thanks for joining my blog,you have a great blog here with some really good information,top job on sharing the knowledge. Here is the link to my blog on the birch sap wine recipe,your welcome to cut and paste it to your blog. If the link doesn't work just go to the search this blog feature and type birch sap wine and it will take you to the recipe. Thank you for the kind words, John, and for joining my blog. I appreciate your permission to post your recipe, but I'll just post the link to your post so you get credit. I'm looking forward to trying it this spring. I have to say that the picture of your young ones drinking the sap is just great,what a natural and healthy way to grow up. I have cut simular spouts to chucks but I added a notch so it can also hold the billy can. Thank you very much! I wondered what the Russians were doing with it. I would not want to add the sugar. I wish we had a way to keep it frozen and drink year-round. Will have to try that wine! :) I have canned it, but then was told by the extension service that botulism can grow. I don't put too much stock in what the extension service says, and always check it out, but the woman said she check with birch sap producers here in Alaska to find out if canning was possible, and she was just passing along their info to me. I wonder if I could add citric acid alone to it prior to canning. It would still lose many of the healing properties, but at least the minerals would still be there. I suppose it would taste more like lemon juice, but that would be fine. Just thinking out loud.